The Monumental starts and finishes in downtown Indianapolis so to avoid the stress of travel on race day we stayed in a hotel just a couple of blocks from the start line. We checked in early afternoon on Friday hit the expo, did packet pickup and then headed over to the Spaghetti Factory for some serious carb loading. After dinner we drove the course looking for good spectator spots for my wife and daughter. We got back to the hotel about 8:30. Sleep was sparse due in part to some very loud hotel guests a couple of rooms down. In fact, we had to call the front desk 3 times and finally they sent security up to have a chat with the people in room 624. My wife and me waiting for the race to start. 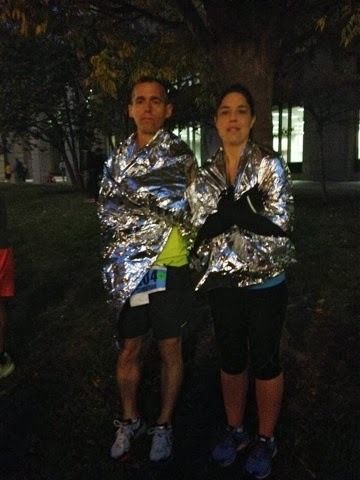 Here is some great advice, save your space blanket from one race to use while you wait to start another race. Now you don't have to waste a perfectly good sweatshirt. You're welcome. The Monumental is getting to be a larger race, the full marathon sold out with a cap of 4500 runners and there were over 13000 total participants between all 3 events; marathon, half-marathon, and 5k. I think I knew more than 10 people running this year, by far the most I have ever known in a race. 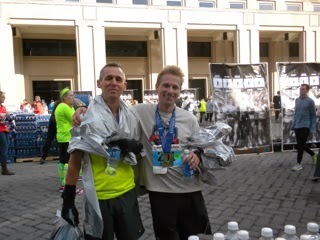 I ran into my friend from the Carmel Marathon, Garrett, near bag check. He asked me what I was planning to run. 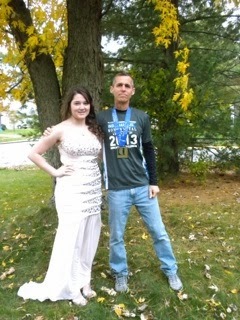 When I told him I was looking for 2:54:59 he said he wasn't sure if he was in shape for it but may try to run with me. 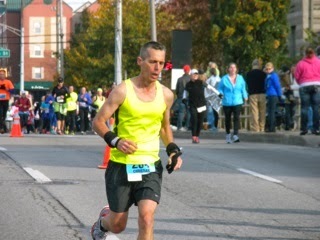 I have missed my goal in both of the other marathons that I have raced by 30 seconds or so. I seem to be unable to do the math required in the moment to stay on pace. Moreover, we all know that the Garmin drifts so this time I was determined to not miss my goal due to GPS error. I went with a smart pace pace band from http://www.races2remember.com. I chose a race strategy they call "Modified Warmup" but I call "Build in enough up front to fall apart at the end" which is what I usually do anyway. A great piece of advice that I got and took was to shut off the auto-lap feature on my Garmin and keep the splits myself. I did this and will never race with auto-lap on again. Between the pace band which let me know what my elapsed time and current mile time should be, and not having the Garmin auto-lap I felt in much greater control of my pace than when I am running based on the "average" pace displayed on the Garmin. I will be using some form of pace chart in all of my future races. This race featured a corralled start with seeding based on estimated finish times. Garrett and I were both seeded in level 2 behind the elites and we met up in the corral and made small talk until the start. We ran together for about the first 8 miles. I enjoyed the time and it really helped move the race along. After about 8 miles he decided that he wanted to slow a bit so I was on my own from there. 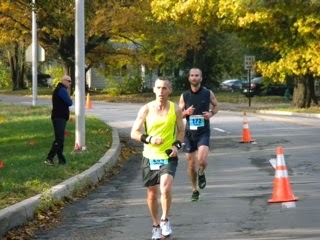 Not much to remark on between 8 and 13.1 except to say that I felt good and was putting time in the bank. I hit the halfway mark and while my pacing strategy allowed me to start slowing here I still felt good and decided to hold pace mile by mile until I started to feel the need to slow. So I mentally focused in each mile to keep the pace in the 6:30's. I was able to stay below 6:40 until mile 22 when I started to fade just a bit but nothing drastic and I wasn't worried as I was still well ahead of goal pace. Mile 23. There they were! My wife and daughter. I hadn't seen them up to this point except for a quick sighting of Kasey at mile 3. My wife had run the 5k and they had been unable to catch up to me until this point. Beginning to slow, this was a great time to see them. Kasey is yelling at me that I've got to want it bad enough to make it hurt and my wife is telling me that she broke 30 minutes in the 5k and that I needed to "go get it." This was a huge shot in the arm so to speak. About a minute after I saw them I glanced at my Garmin and it had me well below a pace of 6:00. While I was stunned to still be able to produce that kind of speed and would have loved to hold it I knew it was a recipe for disaster and focused on getting things back under control. The split came in consistent with the rest so I must have done well. In mile 24 I was passed by a woman who was absolutely flying and looked as strong as she must have in mile 5. I encouraged her along and watched her pull further and further away. I am pretty sure she is the only person who passed me the entire race that actually ended up finishing ahead of me. We were back in the downtown area now. I knew the PR was in the bag and I knew the goal was in the bag. While I maintained my pace I just began to enjoy the last couple of miles. Spectators here started calling out encouraging sentiments using my name, it was on my bib, and I tell you folks, that is more helpful than you can imagine. In the last few miles of a hard run marathon I was hearing things like "Dig deep, Christian, you've got this" and "Christian, just another mile, looking strong!" If you get a chance to cheer at a marathon, do it. If you can use the persons name, do it. I makes a world of difference. I made the turn for the final tenth of a mile and saw the clock and knew that not only was I going to PR and meet my goal, I was going to crush both. I PR'ed by two minutes and had 1:30 to spare to meet my goal. Mile 26.2. Relief. Joy. Satisfaction. The finish line was great. With my goal exceeded and and shiny new PR I got to stand and wait for Garrett and be the first to congratulate him on another successful marathon and meet a dailymile.com friend I had never met before in real life. I found out that my wife had smashed her 5k PR by about 2 minutes and I got to share the joy of my new PR with my daughter Kasey. My only regret is that my youngest daughter was unable to be there at the finish line. She had a prom to stay home and get ready for and I have to say it was worth it, she looked stunning. By the grace of God I've got another successful marathon training cycle in the books. This time I left nothing on the course and I couldn't be more satisfied. The cycle began at the end of an injury and I wasn't certain for the first several weeks if I would actually run a marathon again, let alone PR like this. I have some decisions to make now. I am thinking of switching from Pete to Jack. I first started thinking that I might do this when I failed to PR in a couple of half-marathons. But the half-marathon is not my focus and Pete's plan is still producing PR's for me in the marathon. I have never been hurt doing Pete's workouts and my body is accustomed to them. But Jack's seem to focus more on speed and I am not sure if I will get bored with another Pfitzinger training cycle. I've got a a little while before I have to decide because either way I will be in recovery/build up for at least the next 6 weeks doing lots of easy running. Whatever the case, I've got my hotel booked, my flight booked, and received my official confirmation card from the BAA in the mail yesterday, so plenty of motivation to train for a spring marathon since the next stop is Hopkinton MA on 4/21/2014.